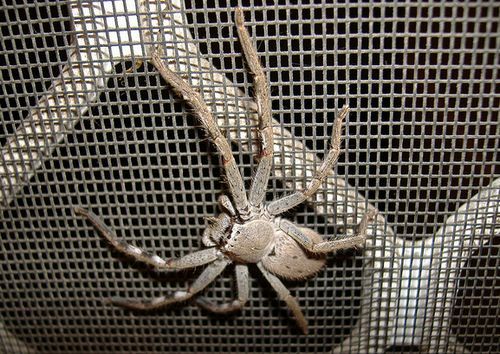 Some Australian spiders are poisonous (actually, venomous would be the correct term). Some spider bites can, at least in theory, be deadly. The emphasis here is on "in theory"! But hey, the horror stories are many, the myths have been floating around for a long time, I think it's only natural that you should want to know more about the venomous Australian spiders before visiting the Australian Outback. This page contains everything you need to know about our spiders. Redbacks can be found everywhere in Australia, especially in the densely populated urban areas. They thrive in the warmer regions. I've seen hundreds, mostly on verandas, in sheds, in storage yards, on industrial sites and inside houses. They also hide in hollow logs, wood or junk piles etc. 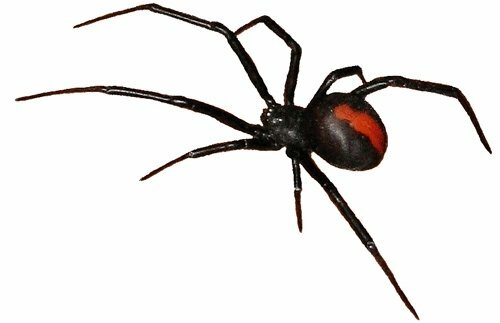 The Redback Spider is related to the venomous Black Widow Spider and looks very similar. The only difference is the red back, or rather the very distinctive red dorsal stripe that you can see in the picture. The size of a female redback spider is around 1 cm for the body (males are tiny). You can see the body is big in relation to the legs. Their webs are very distinctive too. They are messy and always seem to contain several egg sacks, white to creamy coloured oval blobs, 1 cm or bigger in size. Redback spiders love to hide in sheltered spots, holes and crevices. I usually notice the web before I see the spider. I don't know of any Australian spiders that make stickier webs. They are hard to impossible to wipe or brush off and the vacuum cleaner is totally useless. Small insects make up the bulk diet of Redback Spiders, but they sometimes kill and eat much bigger prey, even small lizards if they get tangled up in the sticky web. They also steal wrapped up food items from each other's webs if they can. Redbacks are responsible for the vast majority of serious spider bites in Australia. However, they are not considered dangerous. Only the bite of a female Redback Spider is toxic (the males are too small to bite anyway). To get bitten you have to actually stick your hand into the web of a spider, they rarely leave their nest. The fangs of the Redback Spider are tiny. Even if you do manage to get bitten the bite is likely ineffective. In addition the Redback Spider venom is a very slow acting toxin, and most people don't show any reaction to it (except it itches like crazy). Possible symptoms in those who do react are pain (can become severe), localised sweating at the bite site, and later on more sweating, muscle weakness, nausea and vomiting. A simple ice pack is the best first aid. In most cases it's all that's required as very few people actually develop these symptoms (about 6% of those bitten, to be precise). A pressure immobilisation bandage as used for snake bites or funnel-web spider bites is not recommended. If you do develop severe pain or start feeling sick then you should of course go and seek medical help. Antivenom is available and there is a lot of time (days!) to administer it. 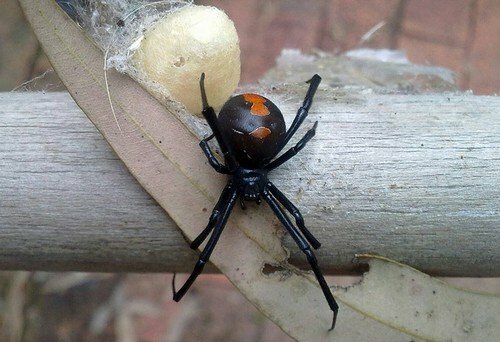 Fewer than 1% of those bitten will require antivenin, and nobody has died from a Redback Spider bite since the antivenom was introduced well over 50 years ago. The Sydney Funnel-web Spider (Atrax robustus) is one of 36 species of funnel-web spiders in Australia (and it's the only one that causes trouble). Funnel-web spiders prefer moist cool habitats and you find them in the south eastern regions of Australia. They live in silk lined burrows and crevices. Their hideouts can easily be identified by the characteristic trip lines radiating from the entrance of the burrow. It is large (up to 4.5 cm for just the body), black, aggressive, and has powerful fangs. The males often wander into houses, especially in summer and autumn, on their search for females. 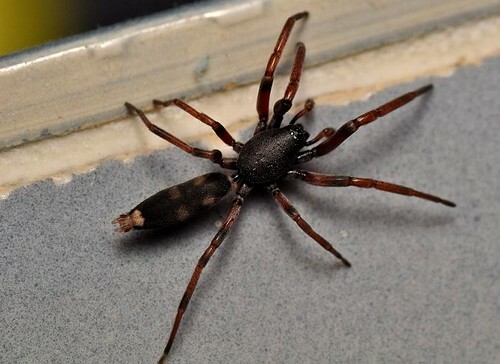 How dangerous is the Sydney Funnel-web Spider? 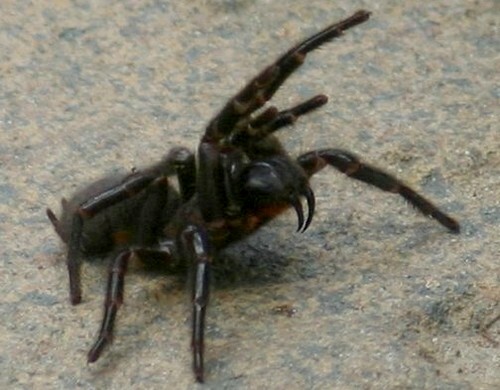 The male Sydney Funnel-web spider is the most dangerous of the Australian spiders. (This is unusual. Normally the female spiders are more dangerous). Actually, I'd say it is the only Australian spider that can be called dangerous at all. Australian spiders will often bite without injecting venom. But if you get bitten by a large black spider in the Sydney area you should take the bite seriously. The symptoms of the venom include pain, mouth numbness, vomiting, abdominal pain, sweating and salivation. Whether you have symptoms or not, apply a pressure immobilisation bandage as explained on the page about Australian snakes, and seek medical help. However, there is no need to panic. Nobody has died from a Sydney Funnel-web Spider bite since an antivenom was introduced in 1980. Before the introduction of the antivenom the rate of human deaths following a Funnel-web spider bite was less than one every three years, and these fatalities typically took several days. There is more than enough time to administer the antivenom. In summary I'd say, yes, by all means, do avoid getting yourself bitten by a Sydney Funnel-web. It's not a pleasant experience. But to call it deadly? 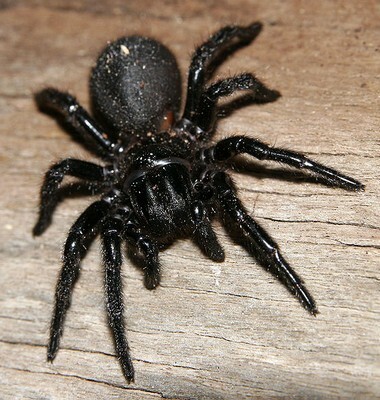 It is interesting to know that the venom of the Sydney Funnel-web Spider is particularly effective in humans. It doesn't affect other mammals, for example cats or dogs, anywhere near as much. On a positive note: all of the Australian Outback is a lot more than 160 km from Sydney. The White-tip or White-tailed Spider (Lampona cylindrata) is found across eastern and southern Australia. It is a small reddish to grey spider with orange-brown legs. The name refers to the faint white spot on the tip of the abdomen. The big and hairy Huntsman spiders look very dangerous, but they are completely harmless and make good pets. They are grey to brown in colour and can measure up to 15 cm across the legs. They live under the loose bark of trees and logs, in crevices and under rocks, but also behind curtains, car sun visors etc. They are fast, too, and they sure can give you a fright! Australian tarantulas or bird-eating spiders are also called whistling or barking spiders. The name is due to the humming noise they can produce when they are disturbed or threatened. They can be found in most parts of Australia and they live in burrows which can be up to a metre deep. 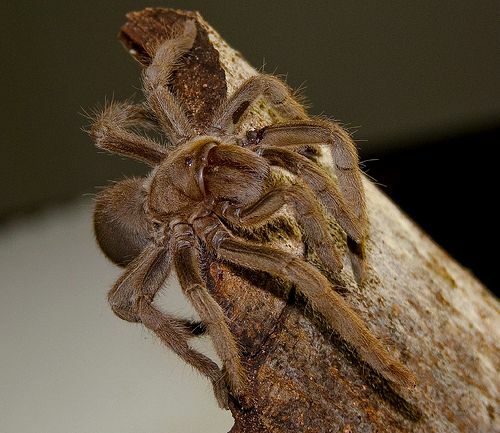 Their overall size is slightly bigger than the Huntsman Spider, but because their body is bigger, the fangs longer and the legs thicker and stronger, they look a lot bigger. Despite their name they rarely eat birds. Mostly they eat insects like all Australian spiders do, but also lizards and frogs. Tarantulas are not aggressive, but will rear up and defend themselves when threatened. Bite numbers are increasing as the spiders are becoming more popular as pets. The bite is painful (as you would imagine from 1 cm fangs...) and can make people ill for several hours. 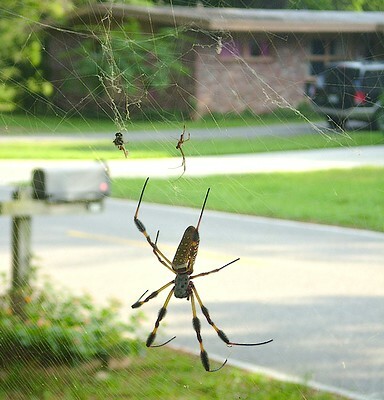 There is another species of Australian spiders that sometimes traps birds, the Golden Orb Weaver. Orb weaving spiders are found all over Australia. There are of course many more Australian spiders. If I have sparked your curiosity and you want to know more try the section about Australian spiders at the website of the Australian Museum.